Patrick Willocq with the representation of his total immersion in a initiation ritual of his experience with the Ekonda Pigmies of the Democratic Republic of Congo and the intention to break out of the stereotypes to show real children in Refugee Camps , to engage them, listen to them, place them out of context, by staging their song, tales, lives and desires, thus defending their dignity with projects that are both reportage and artistic testaments. Patrick Willocq was born in 1969 in Strasbourg, France. He lives and works in Hong Kong, Kinshasa and Paris. A self-taught photographer for 25 years, he has lived 34 years outside France, including 7 years in the Democratic Republic of Congo. In 2012, and following a trip back to the Congo, Patrick decides to devote himself entirely to photography. 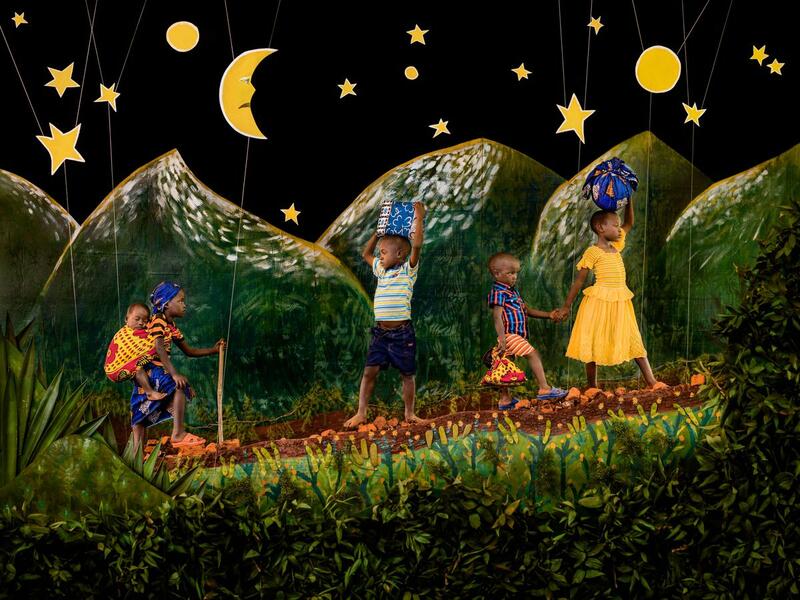 Through his work he wants to offer a different image of the Congo and Africa in general, and go beyond images of war which media tend to focus on. He has participated in numerous exhibitions and festivals including the "Photo Angkor Wat, Angkor, Cambodia, Photo Lagos, Nigeria and Les Photographes Voyageurs, Bordeaux, France in 2013. Bibliothèque Nationale de France, Paris, France Photo Lagos, Nigeria, from Encontros Imagen, Braga, Portugal, Les Rencontres d'Arles, France and Flash Forward, Boston, USA in 2014. "I am Wale respect me/forever wale", was exhibited at both VisionQuesT contemporary photography, Genoa, and Galerie Baudoin Lebon, Paris, France, GRID, Cape Town, Afrique du South, Format International Photography Festival, Derby, Royaume-Unis and Festival des Peuples Autochtones, Kinshasa, Democratic Republic of Congo in 2015 Between 2013 and 2016 he was a finalist and winner of several awards including the Exhibitor's Choice Award, CENTER Santa Fe, the Grand Prix Fotofestiwal Lodz Poland, Lens Culture New Talent Award Finalists, Renaissance Photography Prize Finalists Leica Oskar Barnack Award Nominations au Prix Decouverte d'Arles at Laure de La Bourse du Talent Portrait Lauréat Prix du POPCAP. In 2016 the International Association Save the Children commissioned the project "The Art of Survival" a series of images on what it means to be a child in the refugee camps in Tanzania and Lebanon, presented at the World Humanitarian Summit in London in May of this year.